Our Online Dojo is Live!!! I’m extremely excited to announce the launch of our new “Online Dojo”! This is a project that has taken a tremendous amount of effort, cooperation as well as time. To all who were involved with its development, I would like to extend my sincere gratitude! I’m certain it was well worth the effort, as this additional educational tool will undoubtedly prove to be an invaluable asset in aiding students as they progress through their journey in the martial arts. The members’ area is currently available to students of our dojo who are enrolled in unlimited classes. If you currently qualify, or would like to upgrade your membership so that you may qualify, simply create a user name, see me in class and we will add you to the system. Once inside the “online dojo” you’ll find hours of review videos covering all the techniques taught up through black belt in our system. New content will be continually added throughout the year. Production is currently in process on a 3-part video series covering the major theories behind training self-defense techniques! For a preview of what you’ll find within the members’ area, check out the video below! Students at Tigon Martial Arts learn how to handle a variety of attacks. We teach defenses against punches and grabs as well as defenses against a variety of weapons such as clubs, knives, and guns. This particular video demonstrates one of the many kick defenses taught at our school. 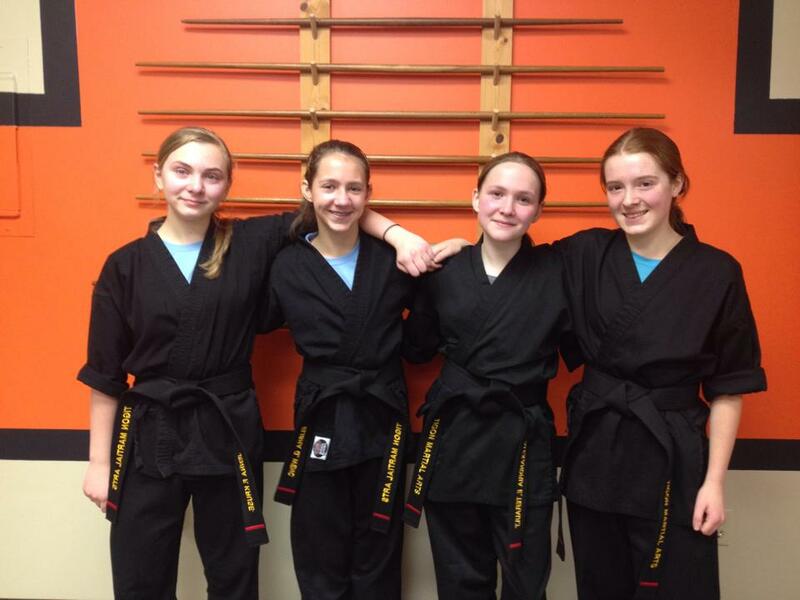 On Sunday, January 18th, after a 5-hour long test, 4 of our students were promoted to the rank of black belt. It is worth noting that this is only the second black belt test administered at our school, since Tigon Martial Arts opened in Belchertown in 2006. Black Belt is a rank coveted by many, yet worn by few. The journey to black belt is a long and difficult one that is filled with many setbacks along the way. Although many begin martial arts with the desire to someday wear a black belt, it is those who have a true love for the journey, who are the ones that do. These 4 ladies have been my students for many years, and one thing I can say without a doubt, is that they all share a genuine passion for the martial arts. One of these ladies broke her hip playing soccer just months before the test, but despite a broken hip she was still at the dojo each week watching class until her injury healed. Each has faced their own challenges, and it was their love for the martial arts, not a belt, that kept them moving forward with their journey even in the face of adversity. Black belt is much more than a piece of cloth that you wear around your waist, it’s something that you become. Congratulations ladies, through years of dedication and hard work you have proven that you are black belts!